Unique ideas often come with unique possibilities. When Square Mile Coffee opened up new kind of coffee venue, one centered on the coffee like a Porsche in a showroom, it definitely made for a new concept. Instead of patrons coming to a cafe for a quick cup-to-go or to sit and utilize the WIFI, this venue would expertly showcase coffee much like a Magic Bullet commercial (just replace the corny "1...2....3" sales pitch with pure coffee nerd-dom). 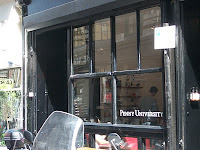 This new type of coffee display was dubbed the Penny University, situated in a small retail space in Shoreditch where the furniture was minimal and the coffee is all infused sans-espresso machine (i.e. they filter, siphon...just not espresso). Upon my visit, the place was brimming much more like a cocktail party, with the patrons energetically engaging the baristas in coffee banter (versus the typical keep-to-yourself environment of a cafe). After studying my options, I caught a barista's attention and ordered a filtered cup (brewed in a Hario) of La Linda Tolima from Colombia. It was made with great care and then with additional grace, was presented in a perfectly-sized glass carafe with a ceramic cup. I noted some nice chocolate flavors, a little caramel apple, some grass, cashew and a bit of cream. The coffee proved deliciously balanced and well-infused. As for other coffee options, they do different brew methods and also offer a plethora of coffee merchandise (including whole beans) but as I mentioned, they don't do espresso. Yet as with most rarities, the Penny University will be disappearing as of July 30, 2010. As hinted in the press release, it seems this concept may resurface elsewhere but the current incarnation will definitely expire in but a few days. I simply thank my fortunes that within the limited window of their 3 month existence, I was able to sample the spectacle. Thus, keep an eye peeled for Square Mile Coffee happenings and in the meantime, try out one of the many cafes in London brewing or pulling shots of Square Mile.